A Daughter’s Choice is book four in a seven-book series that make up the Mindalby Outback Romance series. These stories centre around the closure of the town’s major employer, the cotton mill, and how the shock and ongoing repercussions affect the entire community. With seven authors involved in this complicated project, it was important to have a diverse range of stories. Some wrote about the mill workers who were immediately affected, others about farmers who had cotton bales trapped inside the mill. One story features a counsellor who comes to town to support traumatised residents. I chose to write about the flow-on effect of the closure and the resulting downturn in trade suffered by small business owners. Along with a diverse range of stories comes a diverse range of characters. One of the things I love most about plotting a new story is figuring out an appropriate occupation for my protagonist. In ‘A Daughter’s Choice’ the character of Julian Stone owns a fleet of eight tankers and a fuel depot. His business is one that’s affected by recent events. Prior to the mill closing, Julian had entered into a contract to remove waste from the mill which he planned to turn into ethanol in the small plant he’d been building. With the cotton mill closing, Julian’s business now hangs in the balance. I didn’t have to look far for my inspiration for the character of Julian Stone. For as long as I can remember, I’ve listened to my brother’s stories, as younger sisters do, of his time with Amoco UK, Ampol and Solo before becoming an independent oil distributor three decades ago. In that time, he’s lived through petrol price wars, petrol rationing, and tanker driver strikes. In good years there have been bumper crops and bumper sales of diesel. In bad years, crippling droughts have decimated crops and livestock. 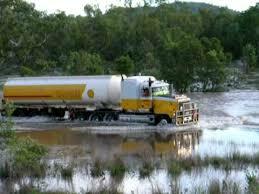 Only a few years ago, fuel tankers couldn’t make it through floodwater to deliver fuel for the harvesting machines before entire crops were lost to water. Tapping into my brother’s knowledge helped me to round out the character I created in Julian Stone. Though fictional, I believe there is a stark realism to our stories of Mindalby. You don’t have to look far in Australia to see examples of towns that have died a slow death due to a factory, mill or mine closing. Ultimately though, the Mindalby authors have written stories of hope and love, of truth and struggle, of triumph and celebration. Stories of people coming together to fight the good fight. I hope you enjoy A Daughter’s Choice. Can one daughter’s choice begin to heal a broken town? Lynsey Carter’s relationship with her father is fraught, so when she hears that the cotton gin mill has closed down – the gin that is her birthright – and her father is lying low, she returns to Mindalby to support her mother and seek out answers. 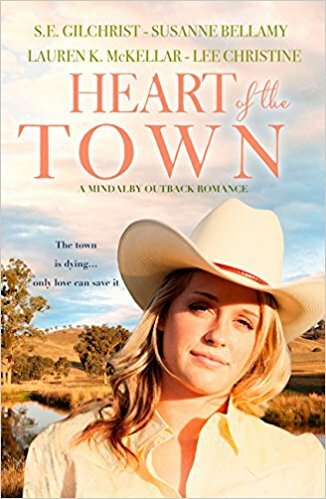 Business owner Julian Stone has been hit hard by the mill crisis, and when his high school sweetheart returns with a new self-assured attitude and a determination to help the town she left behind, the safe life Julian has made for himself becomes even more complicated. As Lynsey is torn between family loyalty and a duty to the shell-shocked community, old passions reignite. But Lynsey has built a life for herself away from Mindalby. How can Julian ask her to stay?